Parker Uniform is having a sale during the month of June. Click HERE for details and don't miss out on the discounts! We are overjoyed to announce that two of our graduating seniors, Robyn Aanstoos and Ava Lynk, have been accepted for entrance to the postulancy (the first stage of formation), of the Dominican Sisters of Mary, Mother of the Eucharist, in Ann Arbor, Michigan. 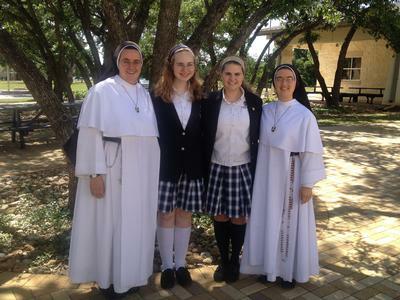 The Dominican Sisters of Mary, who have teaching missions throughout the United States, have been serving in the Diocese of Austin since 2009, and are in the process of establishing a permanent presence here, as they seek to build a large priory in Georgetown. The Sisters have been teaching at Savio since the school opened in 2009, and Robyn and Ava will be the first St. Dominic Savio Catholic High School students to enter. Click HERE to learn more about formation as a Dominican Sister of Mary. Robyn and Ava will certainly remain in our prayers as they continue to seek God’s will for their lives – and we know that they will be praying for Savio, too! St. Dominic Savio was founded with the goal of forming servant leaders in the image of Christ. The best way this is learned is through the example of others. We are truly lucky to have many servant leaders among our faculty and staff. 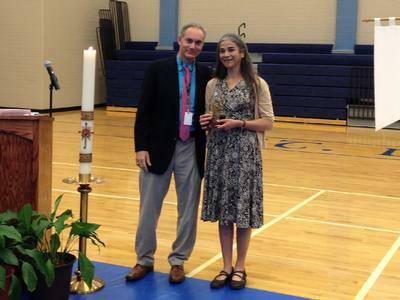 The St. Dominic Savio Award for Outstanding Servant Leadership is presented to the faculty or staff member who has demonstrated outstanding servant leadership in all they do and it is voted on by the faculty and staff. This year's recipient, Mrs. Veronica Camacho, has been a Savio volunteer, parent and employee for the five years of the school's existence. As the school librarian, she has been dedicated to building a library collection for 20 donated books to over 6,000 items, all done on a minimum budget with few resources. She has been a constant supporter of Savio's Catholic mission and has collaborated with teachers and staff to foster a challenging academic environment. CONGRATULATIONS to Savio Yearbook Staff! 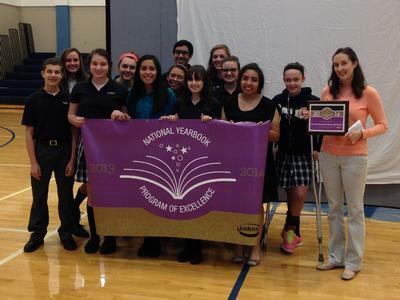 During our distribution event, our yearbook staff was presented with the Jostens National Yearbook Program of Excellence award today for the 3rd year in a row. This award is given to approx. 400-500 schools out of the over 20,000 schools Jostens works with. We also became one of only about 50 schools in the entire country to receive the award 3 years in a row. "It's a special accomplishment", Yearbook sponsor Sarah Saniuk said, "My students worked REALLY hard this year and I am SO proud of them." 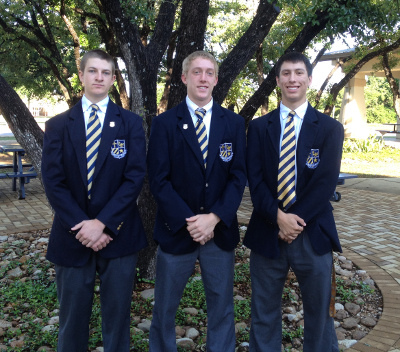 It is with great honor that we recognize the Savio athletes who have committed to play ball in college next year. We are very proud of the accomplishments they have had throughout their career here at Savio and look forward to seeing them continue their passion for their sport into college. 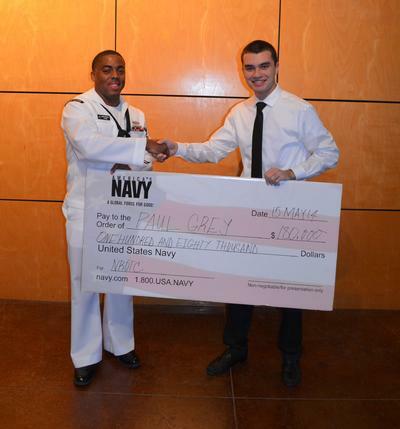 Savio Senior Paul (Chris) Gray received a scholarship from the US Navy which will amount to $180,000. As a Naval ROTC student, Paul will be attending the University of Texas in the Fall. Smooth seas and a wind at your back Cadet Gray! 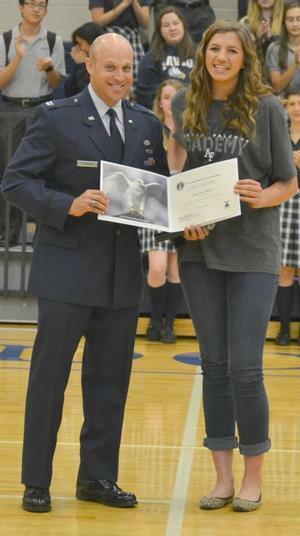 Captain Robinson of the USAF was present at Assembly this week to announce that Abigail Miksch had received an appointment to the United States Air Force Academy Prep School. This appointment funds her college training. Upon completion of her degree she will receive a commission in the USAF. She will decide upon a major after she arrives at Colorado Springs this summer. Congratulations and clear skies in your future to Cadet Miksch! 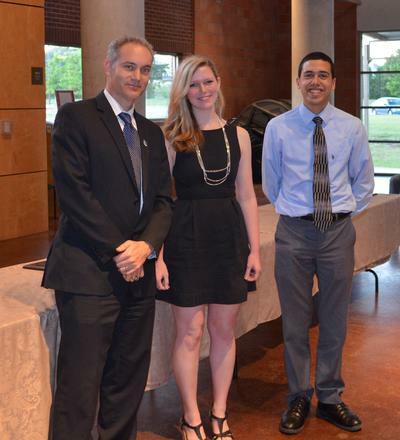 The 2013-2014 Savio Academic Awards were presented at the annual award ceremony on May 15. Click HERE for a list of this year's recipients. Dominic Kress was named Honorable Mention to the TAPPS 4A All-State team. 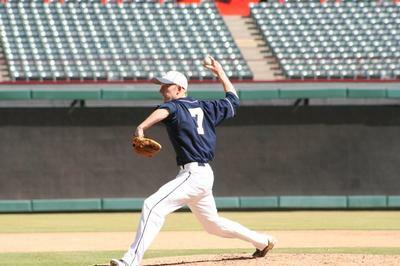 During district play he recorded a 4-0 record with a 0.33 ERA allowing just 4 hits in 21 innings while striking out 27 batters. For the whole season, he went 4-1 with 2 saves and a 2.13 ERA with 35 K's. 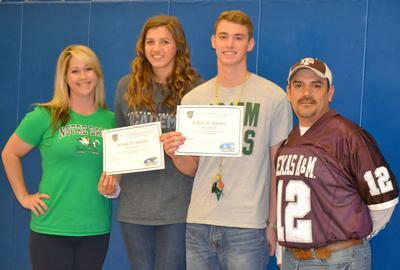 Dominic has earned both 1st Team All-District and Academic All-State awards for the 2014 season. During the 2014 season Dominic was able to add a curve-ball and a very deceiving split-finger to his arsenal. The Eagle Athletic Department would like to congratulate Abigail Miksch and Parker Tadlock for receiving the Female and Male Athlete of the Year Award. Abigail Miksch is a member of the Volleyball Team earning honors for 1st Team All-District and 1st Team All State. 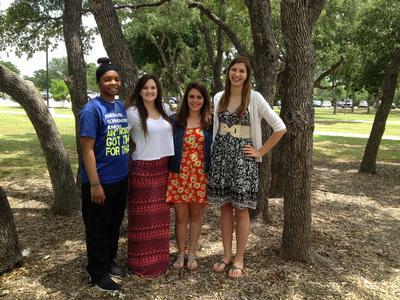 She was also a member of the Basketball Team earning honors for 2nd Team All-District. Parker Tadlock is a member of the Cross Country Team and Swim Team earning All State Honorable Mention in the 100 yard Backstroke. The St. Dominic Savio Girls Golf season came to a successful close at the Sate tournament on Tuesday, May 6 in Glenn Rose, Texas, finishing in 7th place. The team played in its first two-day tournament of the season and all the girls responded by shooting personal best scores. The expectation at the start of the season was to have each girl improve and have a good showing at the district tournament. Expectations were reset as the girls showed great improvement in the early season tournaments and instead of wanting to show well at district, the goal was to place at district and qualify for the regional tournament. 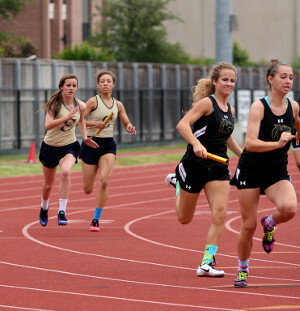 Expectations were further exceeded with the team qualifying for State. The girls will continue to work on their game this summer with the goal of returning to State next season. The girls are looking forward to welcoming the new freshman and continue to build a successful program. Congratulations on a great season Lady Eagles! 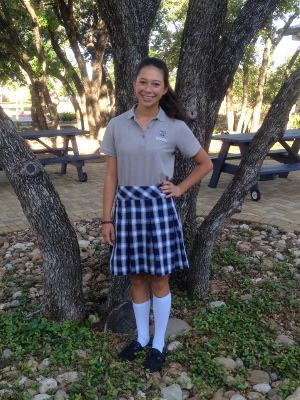 The administration of St. Dominic Savio is proud to officially name Kelly Bowen as the Class of 2014 Valedictorian. Kelly will be attending Johns Hopkins University in the fall. Daniel Parrella will be the Class of 2014 Salutatorian and plans to attend the University of Oklahoma in the fall. Both Kelly and Daniel will have the honor of addressing the Savio community during our commencement exercises. The Savio Golf program is proud to announce Brooke Ellis as an Academic All-State Award recipient for the 2014 TAPPS 4A golf program. To qualify for this honor, golfers must be a High School Junior or higher classification, maintain an A average in the classroom and qualify for the State Golf Tournament as an Individual or Team Member. Congratulations to Brooke as she qualified as both an Individual and Team member. Savio baseball is proud to announce that Schyler Hallberg, Dominic Kress, and Nick Zamora have all received Academic All-State Awards for TAPPS 4A baseball this year. In order to qualify, the players must be a junior or higher in classification, maintain an A average in the classroom and be selected to 1st or 2nd Team All-District. Congratulations to each of the recipients! Sean Casey finished 4th in the discus with a throw of 142'8"
The girls 4x400m relay finished 4th with a time of 4:12.91 which is a school record!! 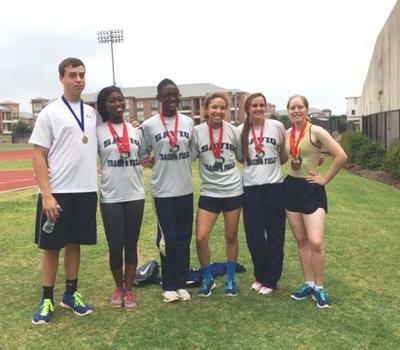 Thank you to all that have supported this small but mighty Savio track team this season! There will be three performances held at the St. Vincent de Paul Parish Activity Center. All general admission tickets are $8.00 and can be purchased by clicking HERE. It was an exciting experience at the regional finals track meet at Houston’s Awty International School’s beautiful campus and track! Our Savio team did us proud! Most of these athletes are placed in the top 10-30 in the TAAPS state rankings! Let’s cheer them on to State Finals.